Life hacks are clever shortcuts that increase the efficiency and ease of everyday tasks. During a move, a few simple hacks can go a long way. While employing the services of a Gainesville moving company, you should expect your movers to use professional packing techniques and proper tools and materials. However, for the portion of the job that you’re responsible for, the following life hacks can make things much easier. Packing is a skill that comes naturally to many. However, when it comes to delicate and hazardous items, people often get hung up wondering about the safest and most cost-effective ways to pack these. Here, we suggest some easy packing tips for challenging objects you might encounter during a residential move. Just about everybody owns kitchen knives — unless you’re one of those ambitious people who cut up food with the edge of a fork — yet many people don’t know how to safely transport them. Figuring out how to pack up a collection of unsheathed blades certainly is a perplexing dilemma. But there’s a progression of solutions you can go through until you find the answer that works for you. The main goal is to conceal the edges so the blades don’t scratch anything or, even worse, someone. If your knives have plastic protective covers, use them. If no covers are available, insert the blades into a knife block and wrap a piece of tape over the handles to secure them in place. If none of those options is available, reach for your cloth potholders. (Everybody has a few of these lying around the kitchen.) Insert the sharp ends of the knives into the pot holders and then wrap the whole thing with tape or a rubber band. Now your knives are secure and can be packed in a box with other kitchen items. Stemware is something else people struggle to pack. Most glasses have some degree of durability. But wine glasses are on the lower end of that spectrum because of their fragile stems, making them trickier to pack up and transport. But have no fear, our movers have a solution: socks. To keep stemware from shattering, head to the bedroom dresser and ransack the sock drawer. Grab one pair of clean socks for each wine glass. Roll up the first sock and put it into the glass. Then pull the second sock over the entire glass. Hosiery might seem like it’s out of place in the kitchen, but using socks in this manner can mean the difference between you arriving at your new home with intact glassware versus a box of broken shards. Socks, and clothing generally, also can take the place of bubble wrap for packing mugs, plates, and other delicate pieces of dishware. Because swimming pools are so prevalent in Florida, many people have access to foam pool noodles. These aren’t just life-savers in the water but also when it comes to packing up mirrors, pictures frames, and other flat wall hangings. Grab a few pool noodles and make sure they’re the ones with holes through the center. (You should also check that nobody will miss them later.) Slice each noodle down the center, leaving you with two halves. Then cut these into pieces the same lengths as the width and height of the wall hanging. Fold one piece over each side of the picture frame or mirror until all four sides are covered. The noodles will protect the hangings items from dents in case of an impact with any other items on the moving truck. Other items that can receive the pool-noodle treatment are your flat-screen TV and laptop. Meanwhile, if you plan to stack the wall hangings on the moving truck, lay a towel in between each of them for added padding. Even better is to use beach towels, which complete the pool theme! Life hacks also can help you prevent and mitigate damage to the walls of your home or apartment. Before you start packing up to move, take a look around and observe all the objects on the walls: TV mounts, shelves, posters. Chances are most of these are attached with nails, and you’ll need a hammer to remove them. One way to do this while inflicting the least amount of wall damage is to wrap a rubber band in a crisscross where the hammer’s head and handle meet. This creates a buffer between the hammer and the wall to prevent scuff marks and dents. Whether you’re removing nails, screws, or thumbtacks, something else you can count on is them leaving behind small yet conspicuous holes. Best-case scenario: the new homeowners are displeased. Worst-case: your landlord charges you to repair the damage. Either way, it’s better to take corrective action before moving out. One moving tip is to keep a bar of ivory soap handy while you’re packing. Every time you come across a pinhole in the wall, break off a dab of soap and insert it into the hole. If the damage is still noticeable, or you don’t have soap to match the wall color, you’ll have to use a proper repair technique: sanding, spackling, and then repainting the wall. Once the boxes are taped shut, it can be a mystery as to which items are inside which container. But not knowing the contents of the boxes makes unloading and unpacking take much longer. Keeping track of which items are inside of which box, on the other hand, allows you to stay organized and complete your move much faster. 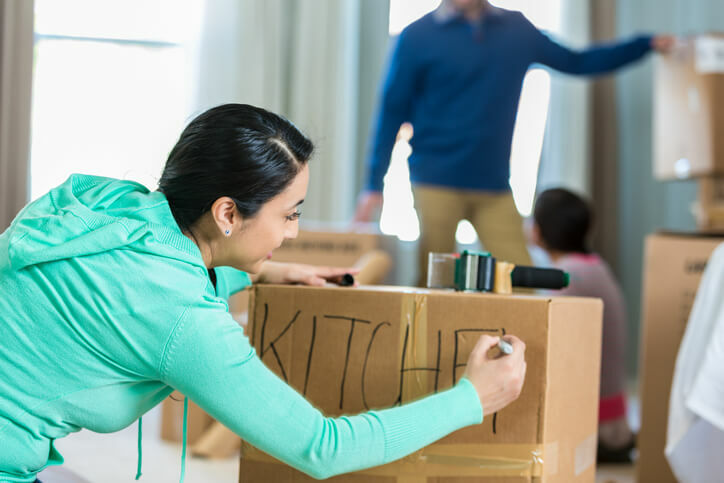 When you know which boxes contain kitchen utensils or bedroom knick-knacks, for example, you can take them straight from the moving truck to the area of the home where they belong. To achieve this level of organization, put a written label on each box describing its contents. You can keep things general (“kitchen” or “bedroom”) or get meticulous with an item-by-item checklist. The latter takes more time upfront, but it allows you to keep track of everything much more easily. Another way to take inventory of your belongings is to snap a few photos of the insides of each box before you close it. If you print out the pictures and tape them to the boxes, these can take the place of written labels. As a full-service moving company in Gainesville, you won’t find UF Mover Guys cutting corners on packing techniques or materials. Everything we do is to the highest level of professionalism and quality. But while we don’t use life hacks ourselves, we’re happy to pass them along to you — anything to make your move easier! Call us to schedule moving services today!